For Kansas artist and firebrand M.T. Liggett, fire was his brand. Over a period of 30 years, the self-taught Kansas artist wrought fire, by means of an arc welder, into sizzlingly provocative metal sculptures. 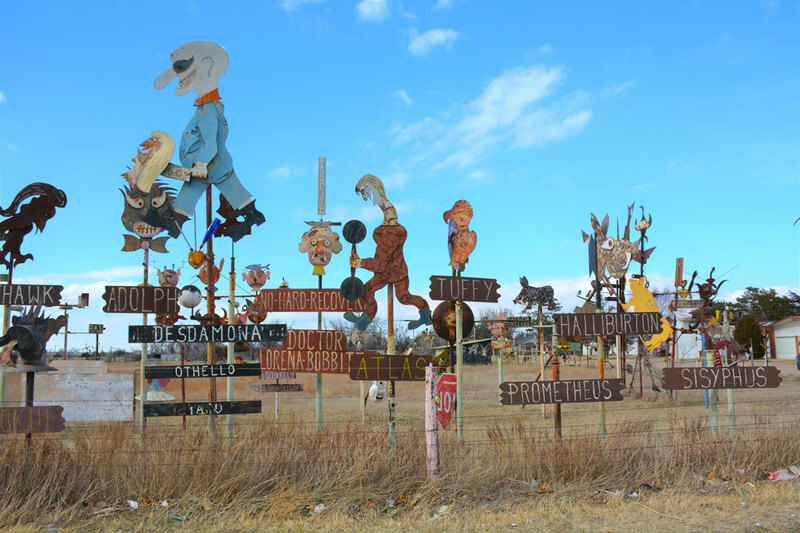 Using scrap and repurposed metal, including farm implement parts, road signs and railroad equipment, Liggett created more than 300 larger-than-life-size silhouettes, which he installed on 20-foot poles along the fence lines of his Mullinville, Kansas, farm. 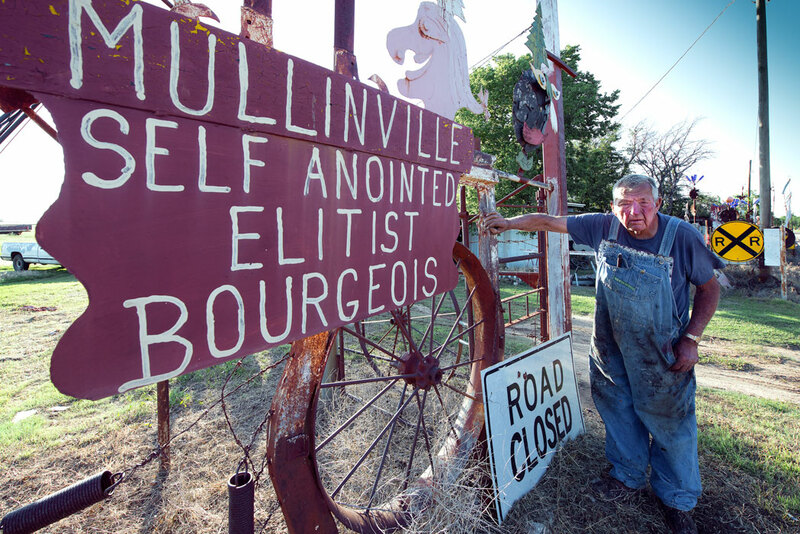 Though incorporating the humor and lightheartedness often associated with folk art, the metal totems burn with caustic commentary on politics, the justice system, social constructs and current events. Although Liggett passed away in August 2017, the works can still be viewed from US-54 and US-400, which intersect in Mullinville, 120 miles west of Wichita. “Our task is to try and determine a vision for interpreting Liggett’s work on site and maintaining the physical work and his spirit in the work, for future generations to enjoy,” Meeker said during a phone interview from his home in Lake Quivira. Born in 1930, Liggett was in his late 50s before he began making art. His first sculpture was a gargoyle created in response to the fatal poisoning of one of his horses. Following that first gargoyle, Liggett launched into creating his large body of work. 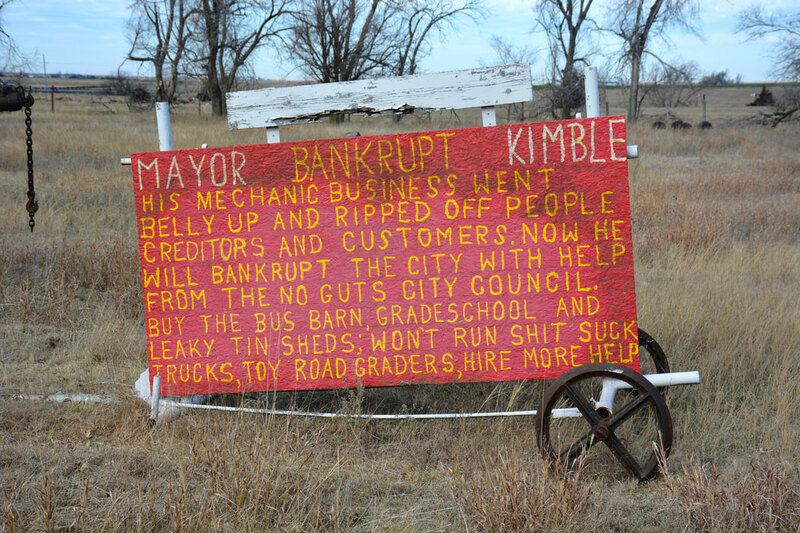 Ranging in scale from eight to nine feet tall, his clownish, whimsical totems include confrontational block-letter slogans, as well as windmills or whirligigs continuously spun by the blustery prairie winds. Unreservedly provocative, Liggett’s sculptures intentionally light fires. Along that way, Liggett left no one unscathed. He was suspicious of politicians, questioned the motivation of religious organizations and sniffed out hypocrisy in everyone. “If you walk up to me and say you’re a Democrat, I’m a Republican. If you’re a Buddhist, I’m a Shinto. If you’re a Catholic, I’m a Protestant,” Liggett said. Well-read and a keen observer of the world, Liggett was also highly educated in politics, history, art, mythology and religion — areas in which he visually and verbally expressed his contentious views. In the sculpture “Six Nincompoops,” in which one member’s head is peeking out of a toilet bowl, Liggett rebuked the Kansas State Board of Education for leading schools into the “stone age” over evolution vs. creationism education. From the time he began creating his work, Liggett became known for his brusque, straight-talking temperament. Determined to realize his candid creative vision, the prolific artist not only constructed 300 large-scale sculptures and totems, but 300 smaller works — all in less than 30 years. During these intensely productive decades, Liggett developed heart problems and had a pacemaker installed. 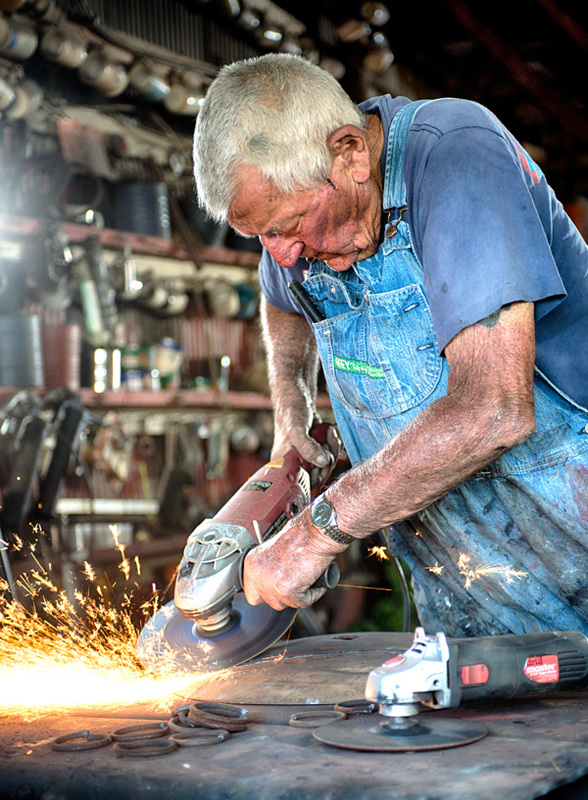 He was instructed by his doctor not to weld because it would adversely affect his health — instructions Liggett defied. Anne Marie Hunter is a writer and photographer who holds a B.S. in speech and art history from Northwestern University and a M.A. in Art Education from Southern Oregon University. Her work includes newspaper, magazine and corporate photography and writing assignments and projects. You can view and read her work at annemariehunter.com.